Paper tearing is a fun and effective technique for giving dimension to your page. Incorporating this technique into your layouts is so easy! This layout was created using papers from the Chatterbox Den Room collection (Den Dark Tie Circles Paper, Den Tie Plaid Paper, Den Light Tie Circles Paper and Den Vacation Plaid Paper), blue ink, palm tree punch and Die Cuts With A View Travel Quote sticker. Set aside the Den Dark Tie Circles Paper for your background. Cut the Den Tie Plaid Paper in half. Tear approximately 3cm off one of the shorter edges. Make sure you tear towards you so you get the white edge. Adhere towards the top of your page, as shown in the layout above. Cut a piece of Den Light Tie Circles Paper measuring approximately 18cm by 14.5cm. Ink around the edges with blue ink. When dry, adhere towards the top left of your page, as shown in the layout above. Cut a piece of Den Vacation Plaid Paper measuring approximately 15.5cm by 14cm. Tear approximately 1cm off the bottom edge, again making sure you tear towards you to create the white edge. Position towards the middle of your page, as shown in the layout above, and adhere. Mat your photo on the blue underside of Den Vacation Plaid Paper and again on the olive underside of Den Light Tie Circles Paper. Cut a tab from the underside of the Den Tie Plaid Paper and tuck behind the right side of your photo mat. You may also choose to add a word or two to this tab, such as where the photo was taken. Adhere your photo to your background, positioning it on the right side of your page, as shown in the layout above. Next, cut a strip approximately 1.5cm high from the underside of Den Light Tie Circles Paper and adhere across the bottom of your page. Cut four rectangles measuring approximately 2.4cm by 5.2cm from the Den Light Tie Circles Paper and lightly ink the edges with blue ink. When dry, arrange them on top of your olive strip in the bottom right-hand corner of your page so that they overlap each other. Place your Die Cuts With A View Travel Quote sticker on top. Finally, punch one palm tree from the underside of Den Light Tie Circles Paper and one from the underside of Den Tie Plaid Paper. 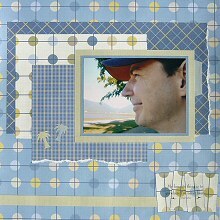 Arrange on top of the Den Vacation Plaid Paper and adhere.